We offer 2 Charting and Scanning Packages. 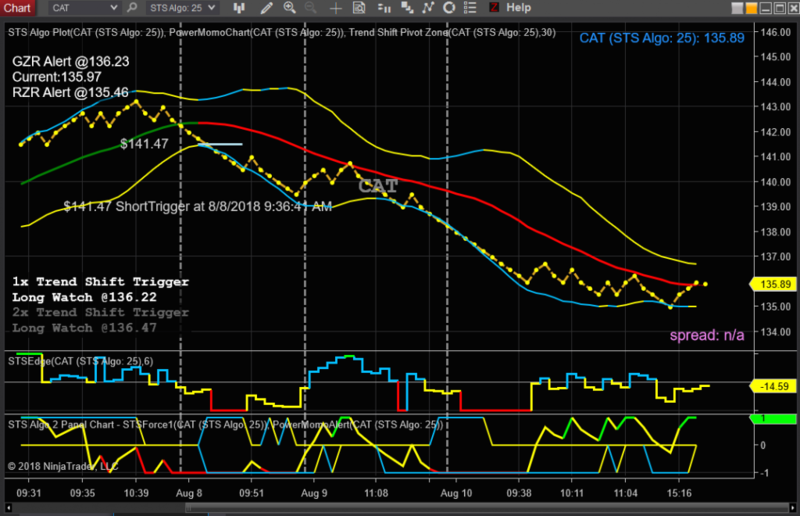 Our Premium Featured Charting Package is our Active Trader Setups Trading Package which includes all (as shown on this website) charts, scanners, and our Proprietary Real Time Projection Alerts which utilize our Factor Charting System to project and activate our Trend Shift Watch Trigger Prices on the Real Time charts prior to the Actual Trigger. Along with our other indicator's included in our package, our STSEdge, STSForce, and our Power Momentum Alert. Our Active Trader Setups Trading Package requires historical tick data and is available for use Exclusively on NinjaTrader Platform. Historical Tick Data can be obtained from many data providers. (It is possible to record data on predetermined symbols so long as you never miss a day of connection to your data source with TDAmeritrade data, if you have a TDA account) A Real Time Historical Data provider is recommended. Active Trader Setups Trading Package uses our Factor Algo charts for Plotting and Predicting Trend, Support, and Directional changes, long and short term. Active Trader Setups Trading Package also uses Standard Candlesticks for Support, Resistance, VWAP, and other traditional inflection point recognition. Traditional candlestick Charts and Scanners are included in this package as well. Those Charts and Scanners are described below in the information about our Swing Trader Setups Charting Package. Our Trading Package is a simple No Emotion, Clear, Concise, and Precise approach to Trading for all Experience Level Traders. Adapts to all price range stocks and can be applied to Day Trading, Option Trading, or Swing Trading. Active Trader Setups Trading Package is a simple swing trading system. There are ONLY 2 Trade Setups to learn and evaluate. Trend Shift (directional change) and Retracement (pull backs). That's it. Our secondary package is our Swing Trader Setups Charting Package (all components of this package are included in our Premium Active Trader Setups Trading Package). This package utilizes Standard Candlesticks. Charts and Scanners are looking for Momentum changes and Momentum Price breaks as shown in our examples of Bull Zone and Bear Zone Chart on Menu item 4 - which uses our Power Alerts to alert momentum changes. The charts and scanners work on any time frame chart from 1 minute to Monthly. The package includes pre built scanners for 5m, 10m, 15m, 30m, 60m, Daily, and Weekly Charts. The alerts can be generated from your personal watch list on any price range stocks. Our Swing Trader Setups Charting Package does not required historical tick data. The scanners will function with the data you provide. Real time Data is required for intraday time frames. Many free data sources may already be available to you to connect to NinjaTrader such as TDAmeritrade or Interactive Brokers. Swing Trader Setups Charting Package can also be used with Free End of Day Data from Kinetick to scan for our momentum changes and momentum price breaks on Daily and Weekly time frame charts and scanners. Register Below and start Studying our Package through our Tutorial on this website, Training Videos, and Training Webinars. This is the ONLY option to begin using the Active Trader Setups Trading Package. Plan to attend Education and Training Events. This is a Trading Plan, NOT a scalping Machine. If you seek quick in and out trades or a quick fix for all your trading issues - THIS IS NOT THE PLACE. All Fees listed below are included in the above Payment Subscription. The Full 6 Months Subscription is paid, the one time Setup and license fee is paid. Access to our members area and on going weekly education and Question & Answer Sessions. We also have a Gathering Room as a courtesy to Share Trading Ideas. You are signing up for $ 69.00 Per Month - No Contract You can cancel your subscription anytime with 5 days notice prior to the next billing cycle. You can cancel your subscription anytime with 5 days notice prior to the next billing cycle. Registration Verification Request for Trading Package or Service Form - Required to Proceed with Installation Please Read all disclaimers. Links are provided above and below this form. Over the next few days please watch as many Education and Training Videos as possible. Your registration implies a commitment to learning. Serious study of Videos and Charts over the next few months can change your trading. Product Purchased Active Trader Setups Trading Package $ 489.00 (4) Month Subscription and Education Quarterly $ 255.00 or Semi Annual $ 459.00 Extension of Active Trader Setups Trading Package $ 85.00 Per Month Subscription Quarterly $ 375.00 or Semi Annual $ 675.00 Extension of Blue Diamond Auto Trading and Active Trader Setups Trading Package $ 125.00 Per Month Subscription Personal Tutoring Package $ 199.00 for (3) 90 Minute Personal Training Sessions. PLEASE Read all items below. Links are provided below this form. I understand it's my responsibility to obtain my own Data Plan and Provider. I have read and consent to your Refund Policy. I have read and agree to your terms and conditions. I have read the Full Risk Disclosure and understand the risk involved. Thank you for your Subscription. Our Staff will reply as quickly as possible to direct you to our Installation Guide.